Every day, marketers are falling more in love with Instagram, thanks to its visual storytelling capabilities, mobile functionality, and community-focused nature. In fact, an estimated 71% of US businesses today use Instagram. It’s the highest-growth network out there—but are you making the most of it? 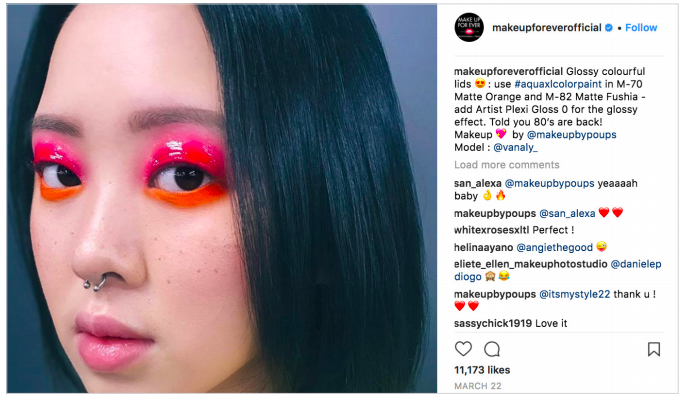 Here are 10 lessons we’ve gathered from the real people, influencers, and businesses that have mastered Instagram strategy. A visual platform like Instagram makes collaboration between brands and consumers more of an art form. A naturally visual company like world-class imaging brand Canon knew how to leverage that art. The camera maker’s social team struck a compelling balance between social content that simultaneously tells a story and promotes their product: with the #ShootForGreatness story tag campaign. 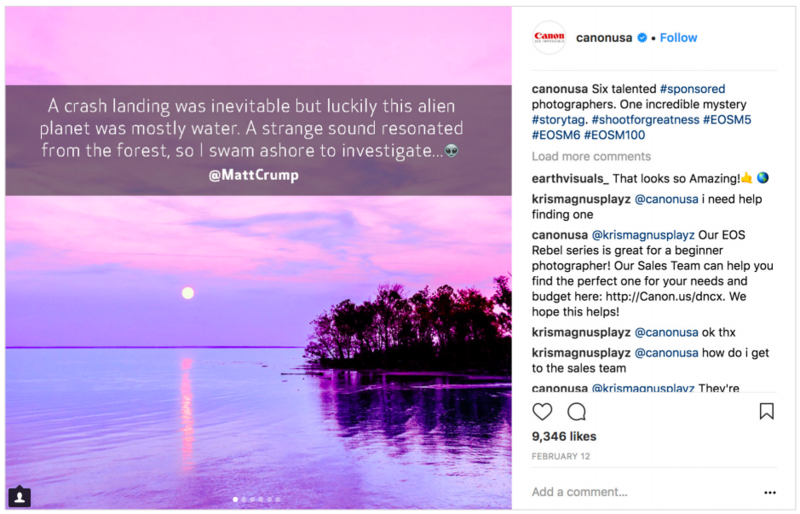 With the help of a handful of influencers sponsored through the brand, Canon managed to create a cross-country, social version of the ‘pass the story’ game. 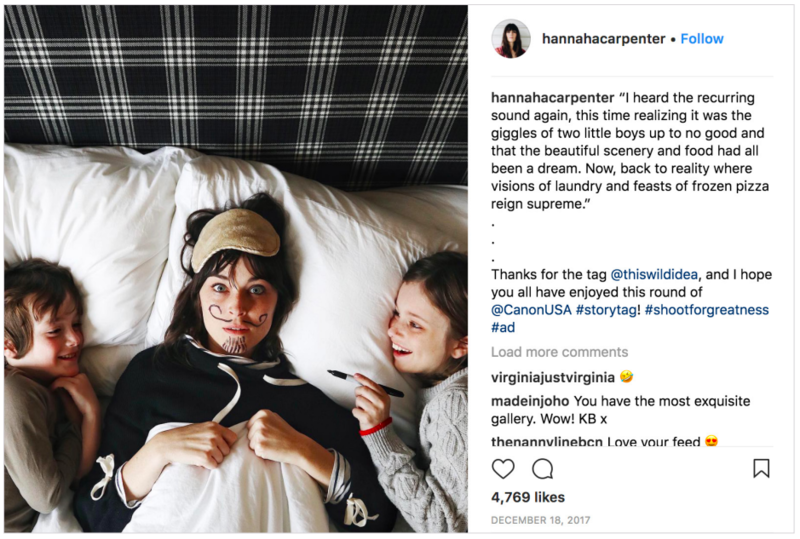 Influencers participating showcased their personal photography and sent their own followers on a journey from account to account, to stitch together pieces of a story. This story ultimately led Instagram users to Canon’s latest camera. Collaborating with influencers and real product users, and focusing on interactive content can make a big impact on your social engagement—and help you stand out among the many businesses flocking to Instagram. If you’re looking for social media influencers to help represent your brand, try leveraging a social media listening tool to find those individuals trending around certain topics. 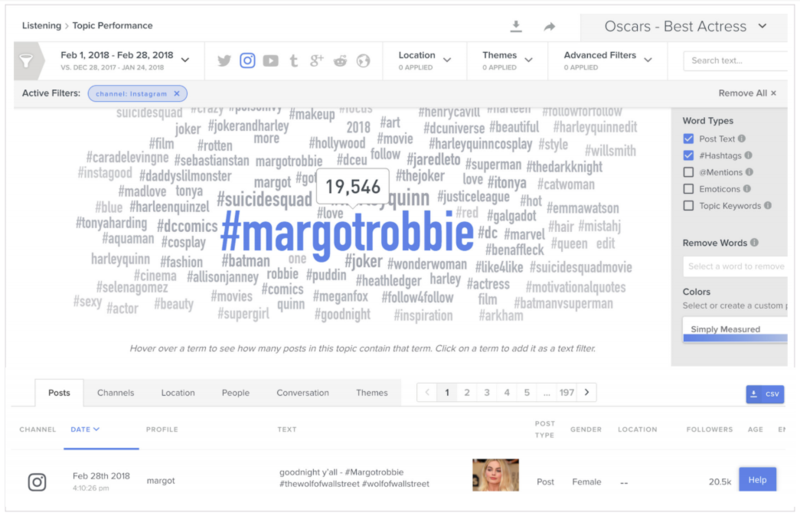 Below is a small example of the power of social listening, creating a word cloud of all the hasthags used for “Best Actress” on Instagram during The Oscars. Topics aren’t limited to famous actresses. If you’re looking for micro-influencers then narrow your queries and find someone more relevant with a sizable following. Whether you’ve just laid eyes on an old, familiar snapshot or seen a glimpse of an era you can only imagine, nostalgia captivates you and elicits a specific emotional response. It’s an especially powerful tool for a business attempting to create emotional connections with its audience (especially if that audience is a fan of HGTV’s Property Brothers). Taking advantage of #tbt (Throwback Thursday) as a time to drop casual history lessons expands on your brand’s origins. It’s an engaging way to utilize this visual platform to shape a narrative around who you are and always have been as a public entity. 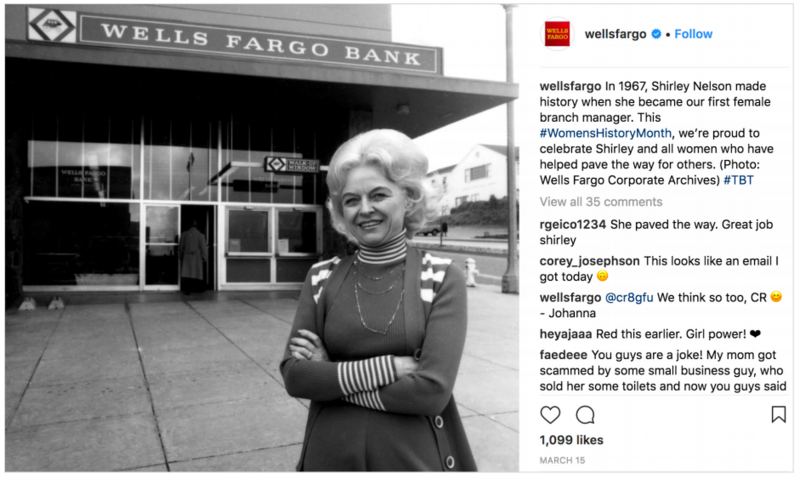 Wells Fargo, for example, likes to dig deep into the corporate archives on Thursdays to share a memory from the early days of their company. There are a lot of brands today that were born on social media and consumers have had the opportunity to follow those brands through their maturation. But for older, established brands whose success predates the digital boom, participating in #tbt opens up a wealth of interesting opportunities means a little more. Sometimes the throwback cleverly aligns with world events, and sometimes it’s just a trip down memory lane. 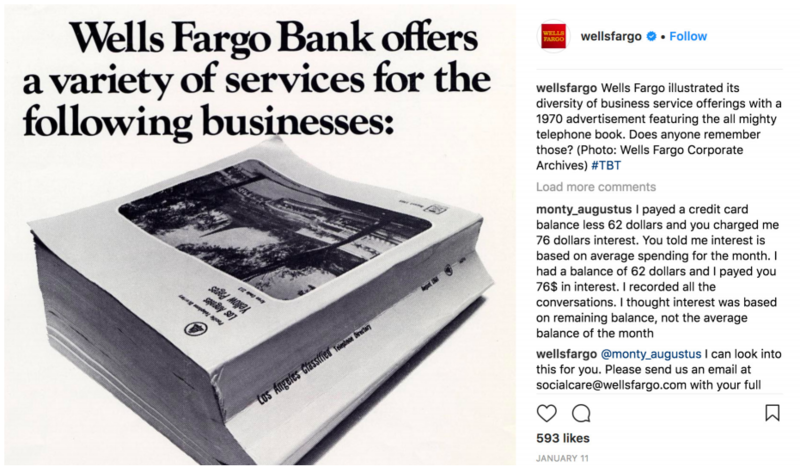 It’s effective because it’s different from anything else on Wells Fargo’s feed. It’s not directly selling, promoting, teasing or making a statement, it’s merely bringing their audience deeper into their brand journey. Keep in mind that as you create and run campaigns like #tbt you should be tagging content consistently. Tagging your outbound messages by theme or campaign enables you to later sort and report on their success. If you find that #tbt posts don’t perform as well as others, it may be time to plan a new campaign. 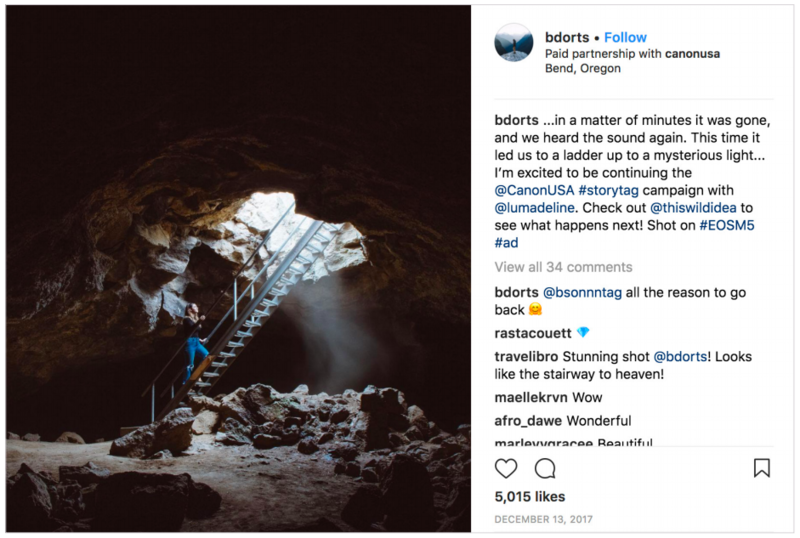 With over 200 million Instagrammers visiting at least on Business Profile daily, it’s one of the most engaging social platforms for brands today. Your Instagram profile page may be the first point of contact for a consumer seeking you out or stumbling across you on social. It’s time to build it up and nurture it the way you would your website’s homepage. Features like Highlights make it possible to pin important brand messages, Stories and opportunities to sell. 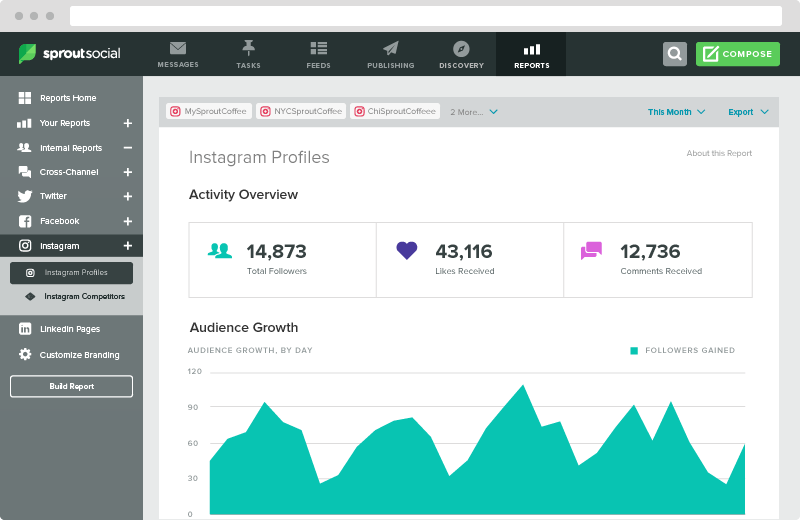 That plus a well-crafted bio section gives users everything they need to know about your brand at that moment. There is also the incredibly important Instagram bio. There are a number of components that make up your Instagram Bio section. Visually, the profile page should include a profile photo that is relevant to your company. This can be a logo or a product photo. Whatever you choose should be as attractive on your profile as it is when it’s minimized in the feed. Your username shows up at the top of the profile page and this will be how other accounts can tag you. In a more prominent spot on the bio is where your name is located, which becomes bolded on the profile. Both your username and name are searchable in the Instagram search field, so name them carefully. Here, you have 150 characters to sum up your company and potentially have a customer take action. Your bio can include Emojis, so if it goes with your brand voice then be sure to spice it up with some fun characters. Here’s where you can link users to your website. Some companies choose to keep the link one consistent page, such as their homepage, while other will swap the link consistently when they have a new photo telling users to click through their homepage link. The category that appears under a company’s name is directly tied to the category that is selected on the linked Facebook Page. Email: Entering an email address into this selection will generate an Email button on the profile. The button is located under all the other information. When a customer clicks Email, the app will prompt you to open the default mail app on your phone. Directions: If you own a business that has a brick and mortar location, entering your full address will help customers find you easily. When customers click on this button, it’ll prompt them to a map app on their phone. Call: Another way to show your contact information on your business profile is to add a phone number. When someone clicks the button, a prompt shows up to directly call the company. You can put content right in consumers’ hands with brand ambassadors. But the wealth of available content requires a thoughtful approach to leveraging UGC. A sporadic share here or there isn’t a strategy. Followings bloom more organically around a singular persona. 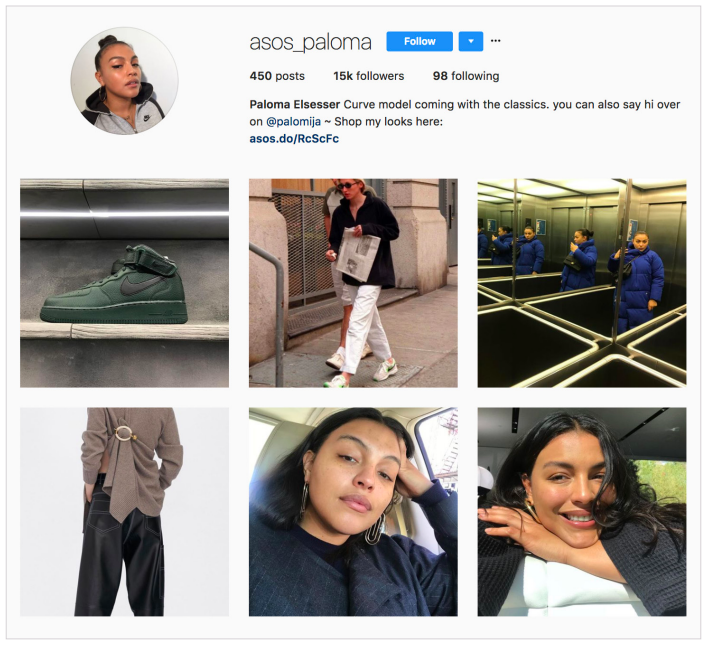 So do what fashion retailer ASOS did and assemble a team of brand ambassadors to show off your goods their way, on their time, on a page of their own that’s transparently dedicated to your business. 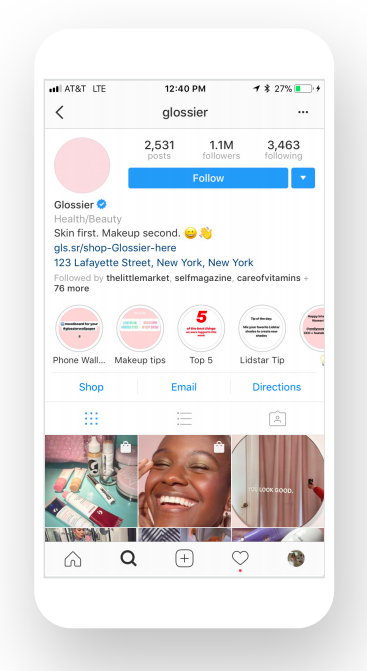 You can also equip a team with branded accounts (if not employees, influencers and micro influencers), so everything they share on that account is instant UGC. Users will begin to connect with the ambassador and their content first, and with your brand indirectly, garnering you reach on a larger scale by less invasive means. 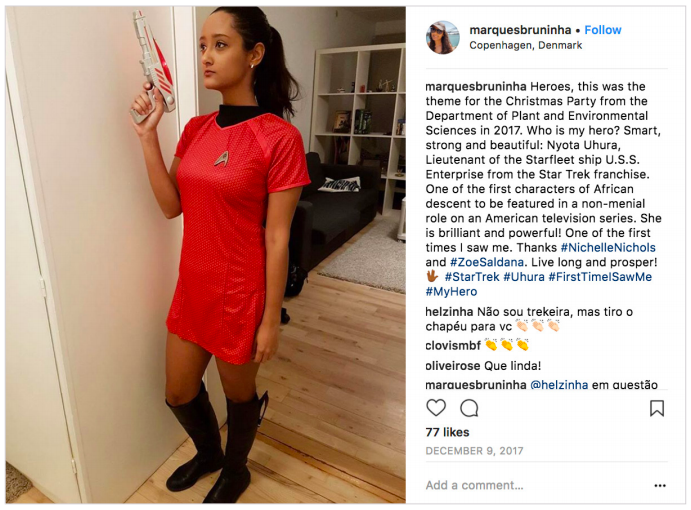 There are a few key principles that businesses on Instagram can adopt in order to strike campaign success with hashtags. First, keep it unbranded. The hashtags you create should rep your brand without directly mentioning it. If consumers can effortlessly correlate your brand with the unbranded hashtag you’ve created, it speaks to the efficacy of your campaign. Similarly, if people recognize your unbranded hashtag outside of your brand, it’s a viral success. 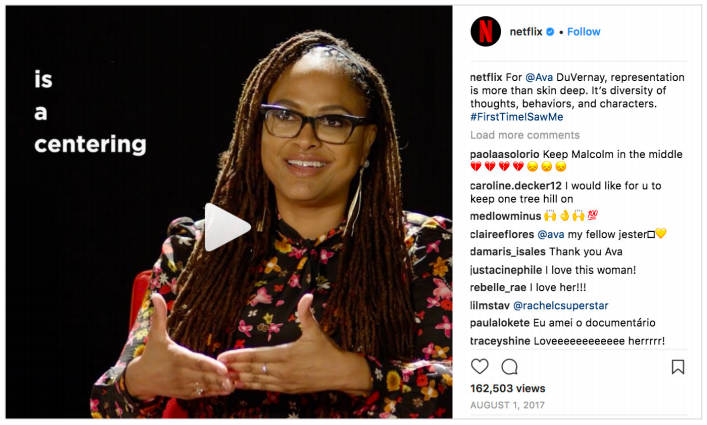 Netflix took the latter route when it launched it’s #FirstTimeISawMe hashtag, which ultimately transcended its own account and became a small movement— across platforms—asking people to reflect on the first time they saw themselves in a TV character. Second, try to keep your unbranded hashtags specific and relevant. Since Instagram rolled out the ability to follow hashtags, it’s even more vital to land on a hashtag that sticks. A hashtag people want to keep up with. Unsure of what hashtags to use that are unbranded but still brand-adjacent? 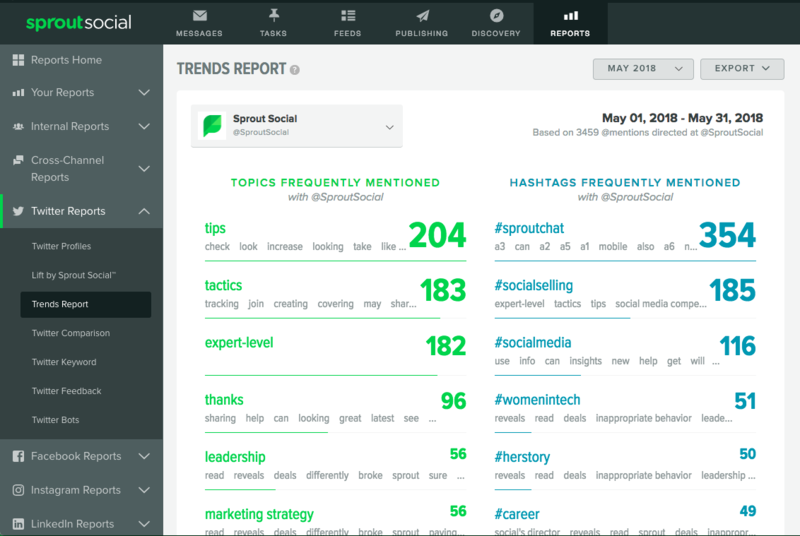 The Sprout Social Trends Report shows the topics and hashtags you’re most frequently mentioned in. Use these topics and hashtags to inspire your next great campaign! With Instagram you have a sleek, aesthetically beautiful platform to creatively showcase everything your brand is about. What you don’t want to do is inundate the audience in this type of space with ads. Understand that your consumers are on Instagram for a different experience than other social platforms. Adapt to the environment and realize every function of the app has a potential out-of-the-box use to you. With the addition of Snapchat-like Stories feature to the platform—one of the few places in the app that allows you to link outside the app—it’s tempting for businesses to capitalize on that feature to sell and push product-focused content. But Instagram Stories are actually an ideal opportunity to give your audience a glimpse of something deeper. Office culture, sneak peeks, events, people stories, polls—Stories is a place to showcase the ephemeral aspects of your brand or business that consumers don’t normally get to see or interact with. Behind-the-scenes looks makes your following feel as though they’re getting exclusive content and leaves the perception that you’re an open book to your audience. 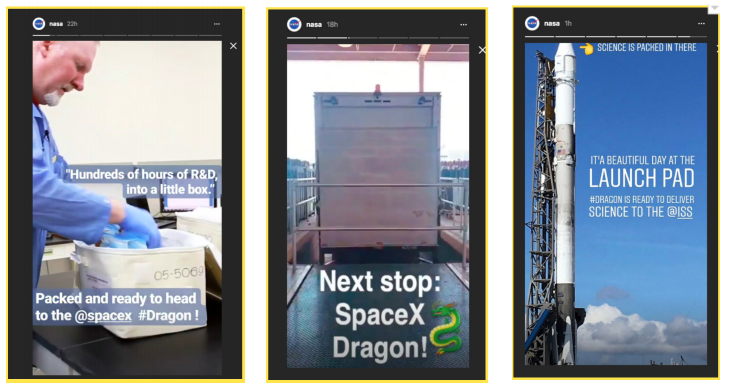 NASA uses Instagram Stories to showcase internal happenings and document the day-to-day of their organization to their social audience. Part of Instagram Stories’ appeal is humanizing concepts, organizations, products, and events. Separate from the curated content of your feed, Stories highlights that humans make a brand’s social presence what it is. NASA’s behind-the-scenes footage, research, and uncut content fleshes out a raw digital story for the viewer. And the format of a series of quick, engaging videos that disappear after 24 hours is useful for more than behind-the-scenes content. Takeovers, product tutorials, teasers, CTAs—content with a sense of urgency around it all has a place in Stories. Instagram is the ideal platform for spotlighting customers. Your following is made up of an army of valuable, talented individuals that use the app to host their own skills and perspectives. Leverage this platform to emphasize your relationship with them by promoting them as part of your brand’s story. 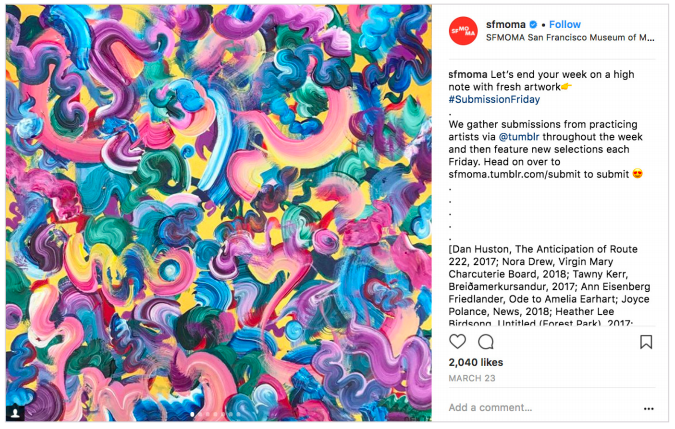 The San Francisco Museum of Modern Art does this by hosting a weekly #SubmissionFriday, where followers can submit their own art for a chance to have their work acknowledged by the SFMOMA audience. Similarly, beauty mega brand Make Up For Ever shows off the work of aspiring MUAs, using their products all around the globe. Sometimes weaving your customers into your story simply means highlighting them for who they are and how they embody your brand. Action camera brand GoPro regularly shows off the adventurers who use their product, and the epic scenes they explore and share. True stories ultimately bridge the gap between your offerings and the people who use them. The most popular brand on Instagram, National Geographic (86.9 million followers), proves that “going long” can drive success. Every NatGeo post is a veritable feast, as far as social posts go—beautiful imagery and a thoughtfully crafted, educational captions to boot. NatGeo gives the audience the chance to completely fall into the storytelling and the audience doesn’t disappoint in return. 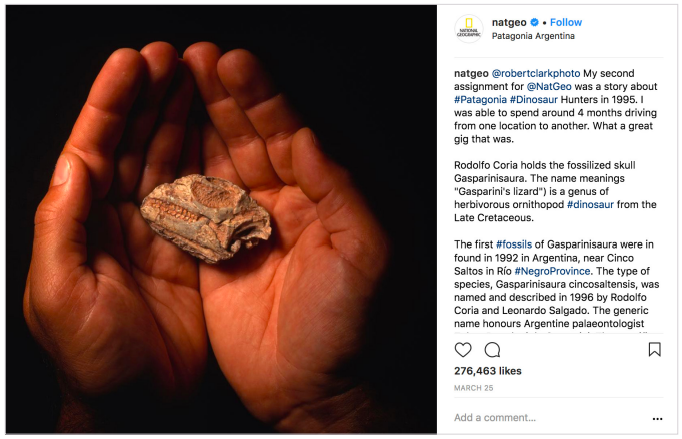 In 2017 alone, the NatGeo Instagram account garnered 1.53 billion total actions, ranking the highest in user engagement on the platform last year. The notion that consumers aren’t interested in reading more than a few quippy words in advertising these days isn’t universally true and brands willing to experiment with informative, relevant long-form copy are seeing dividends. 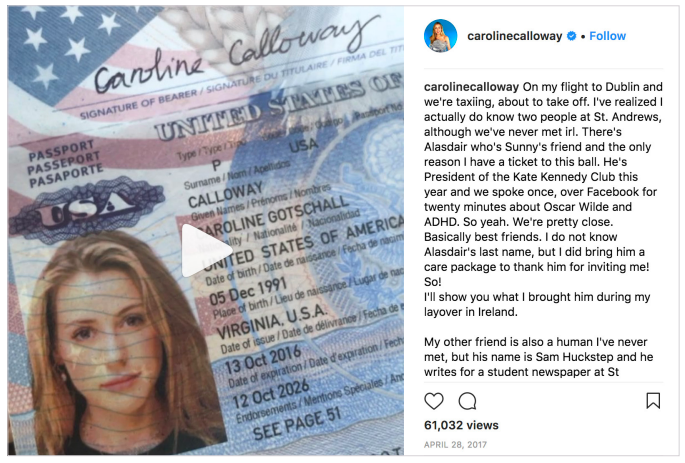 Blogger Caroline Calloway puts this theory to the test with every post or Story, challenging people to stick around, care and share their own stories. Since the inception of Instagram, Calloway has put her life on display, each post teasing a little bit of a larger narrative. And the followers come flocking to hear every detail. “A new kind of memoir,” as her pending book deal puts it. Instagram, if you think about it, really is a new kind of memoir—for both the individual and the brand. Because after all, they’re one in the same on social. Brief, snappy captions work, but don’t fear stepping outside of the norm and following social storytelling trailblazers like National Geographic or Caroline Calloway. If the words resonate, consumers will put a brake on the scrolling for a moment to appreciate quality content. A platform that’s all about visuals means every post, action, edit, caption and video is creating or feeding a unique aesthetic for your brand. 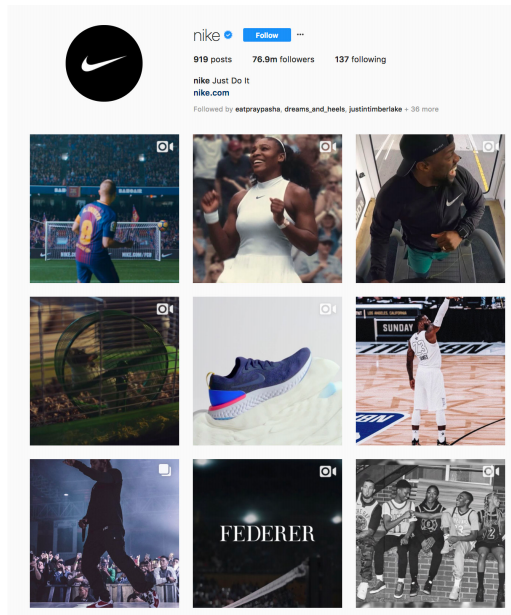 Nike, a brand that comes in just behind National Geographic in terms of success on Instagram, sets the bar high for social brand identity. Nike posts images that embrace a lifestyle, rather than focusing solely on product. Inspirational, motivational and inclusive, they use creative copy that speaks both to pro athletes and exercise noobs alike, in all aspects of life – not just at the gym. For every post about shoes or apparel, you’ll find a post about people, music and art. 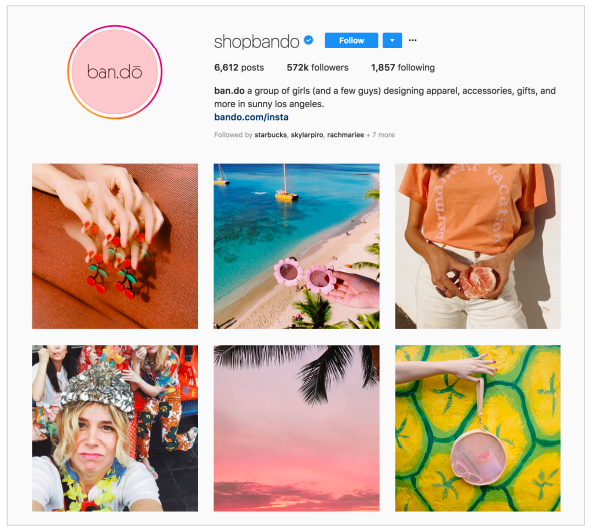 Another example is LA based design house, Ban.do, which has also mastered a lifestyle-driven brand identity on Instagram. The small business specializing in gifts & accessories proves that a big splash of unique energy and charisma across their vivid feed—and a lot of company culture focused content—goes a long way in establishing what your brand stand for and who it caters to. Because at the end of the day you’re not just trying to convince people that your product is good, you’re showing them what they’re life could look like with your product in it. You can fold your followers into your brand more wholly by using social as a vehicle to extend opportunities to them. More than just hosting a contest or giveaway to elicit superficial engagement, leverage the power of the platform to scout talent that can join forces with you. 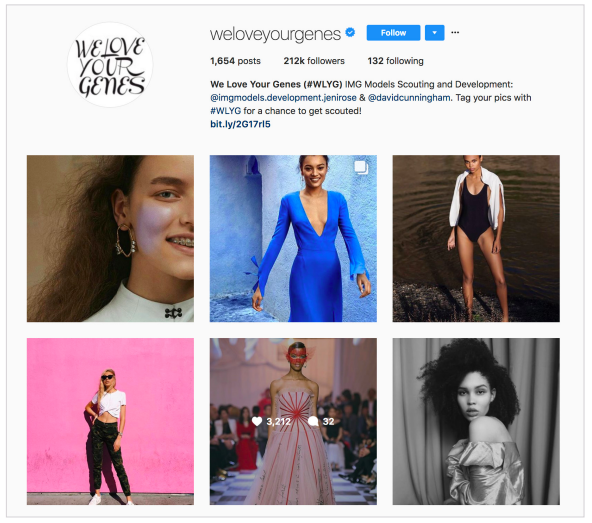 IMG modeling agency executes this beautifully with their #WLYG (We Love Your Genes) campaign and account to find its freshest faces. Opening up your brand to what the public has to offer, not just the industry, is ultimately more valuable than gamifying your social interaction for likes and comments. 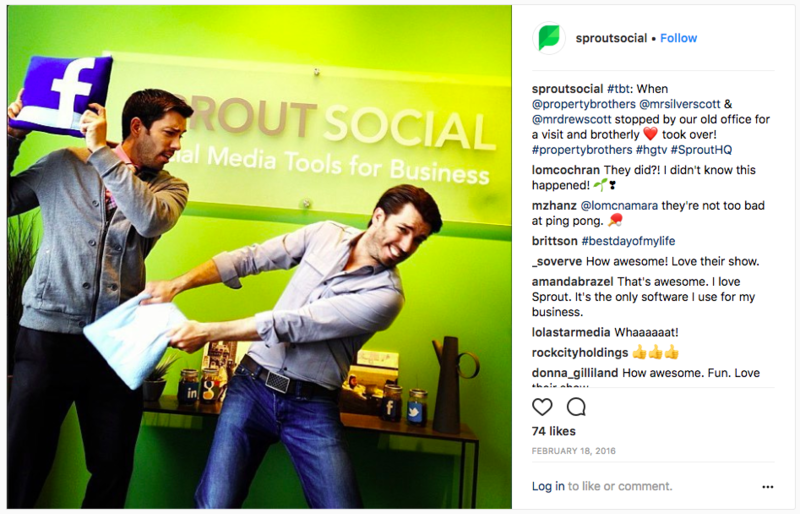 Sprout Social is a complete social media management solution for businesses of all sizes, and agencies. 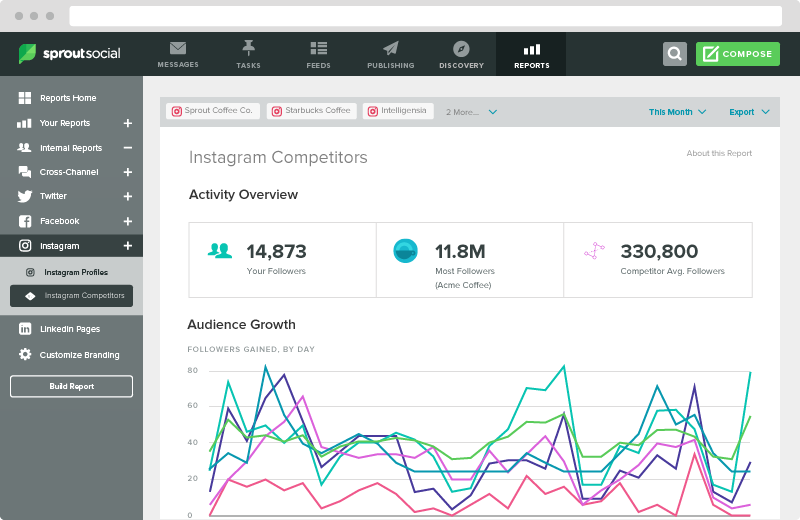 Sprout Social’s Instagram analytics give your brand the data you need to monitor your performance. 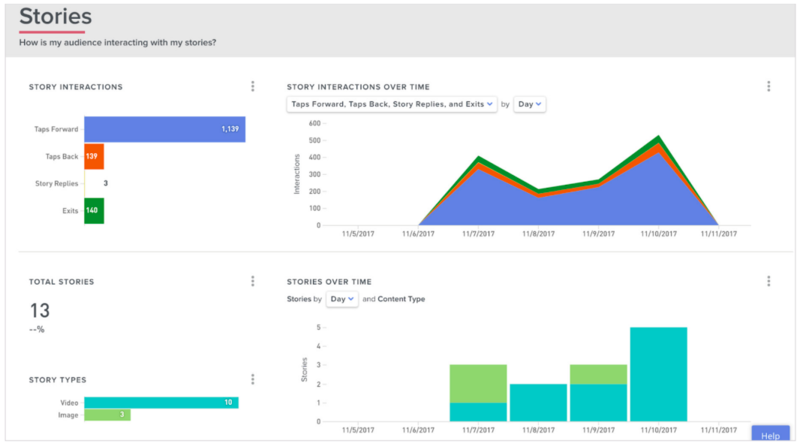 Whether you want to know which Instagram post got the most engagement, how your audience has grown or other critical metrics, you can see it all in Sprout.